I have not done a very good job of adding patterns to the blog. To try and make up for that here is something to keep you busy for a while. Twenty one clock patterns for you to cut. These patterns require the 1 -7/16 mini clock inserts. 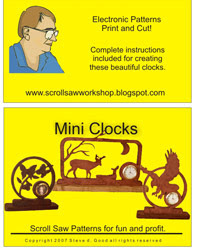 Check the links on the blog for places to purchase the mini clocks. Use a 1-3/8 inch forstner bit to cut the hole for the clock. I hope you enjoy these patterns. You can do anything you want with the finished projects just don't reproduce or distribute the patterns for personal profit. You may pass the patterns along freely as long as the file is not changed in any way. If you like this pattern book and would like to support The Scrollsaw Workshop Blog please consider a donation to the site by clicking the donate button at the top of the page. Get you clock inserts form Clockparts.com now.